Efficiency Maine discounts screw-in LEDs at retailers and distributors across the state. There’s no paperwork for customers to file and no waiting for rebate checks. 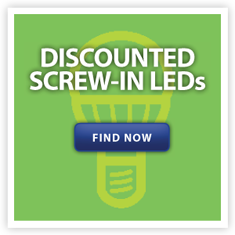 Discounts are available on LEDs of various bulb shapes, bases, and wattages. Eligible products include A-line bulbs, spotlights, floodlights, and candelabra bulbs. To find a participating retailer, click here. To find a participating distributor, click here. To find the best prices on retail bulbs, click here. All customers are eligible as long as the bulbs are installed in Maine. Customers buying more than 20 bulbs at a retail location need to ask for a bulk-purchase waiver. Customers buying from a distributor must provide a Maine installation address as well as other information. Bulbs purchased from a distributor may be subject to inspection. It is not necessary to work with a registered contractor.